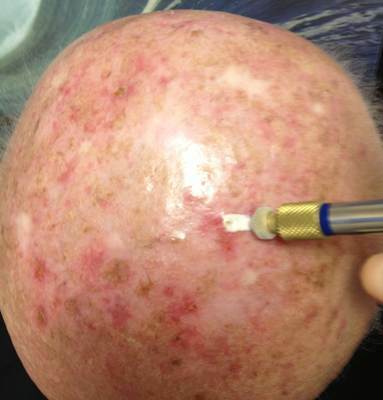 A message from Dr. Jacobs: The following are photos of Actinic Keratoses of the scalp, lip, ear, and nose. Actinic Keratoses are precancerous, and to prevent skin cancer from developing on your skin, I believe they should be treated. There are many different ways to treat Actinic Keratoses. Cryo spray is the most common way to treat, however, there are other very helpful ways to treat Actinic Keratoses. Some methods include cautery, TCA acid, Blue Light, laser, Solaraze, Picato, and 5-FU. People often ask how do I treat Actinic Keratoses, so, I will explain. First, I examine the patient, then, I treat each person differently according to their individual particular findings. Because many people have many lesions, I prefer to treat my Actinic Keratoses patients step by step and little by little. With baby steps, the patient is not so overwhelmed by pain. Now, each person will tolerate a different level of pain, but, if I try to treat everything at once, the patient usually becomes frustrated and overwhelmed. My treatment philosophy is “ By the yard, it’s hard, but, inch by inch it’s a cinch.” Remember, Actinic Keratoses are like weeds. The come and go and come and go and will always grow. Thus, I try to focus on keeping them under control. In other words, it is impractical to think that you can get rid of , Actinic Keratoses with one treatment all at one sitting. Because Actinic Keratoses cover so many square inches of the body, Actinic Keratoses therapy is an on going process that I suggest be done periodically, regularly and little by little. Thus, I tend to not use the blue light, as it is very cumbersome and many times too much for most patients. The patients go through a lot, get nicely cleared, but then stay gone for too long, only to return with skin cancers missed by lack of regular periodic examinations. You see, part of the little by little way of treating Actinic Keratoses is that it allows me to do regular periodic exams on my patients. Thus, I can detect and treat many lesions that are very close to cancer. I find that the regular periodic visit and the little by little method is a great way to prevent the skin cancers from actually growing. So, I mostly treat with cryo and cautery and topical therapy. For topical therapy I try to tailor treatments to each different patient and their individual needs. I can use, Picato and Solaraze, and they are wonderful, however, with Medicare limitations, the insurance companies often give problems covering these. Thus, because of insurances, I often find myself prescribing topical Generic 5-FU. Now, topical Generic 5-FU does an incredible job, and is well tolerated if the patient does it by the little by little method. In other words, just do small areas at a time. Every two weeks, do a small area, and then, every two weeks, change to another new small area of treatment. Now, you may have heard people say, “I’ll never use that stuff again!” And, that is mostly because they did their whole face at once. That is too much! It’s like drinking a whole bottle of hot sauce in one gulp. NO! I suggest small drops of hot sauce to flavor your food, and small amounts and small areas of 5-FU to treat your precancers. Actinic keratoses: (AK’s) Actinic keratoses are rough, slightly raised scaly growths which may become as large as one inch or more in diameter on sun exposed areas of skin. 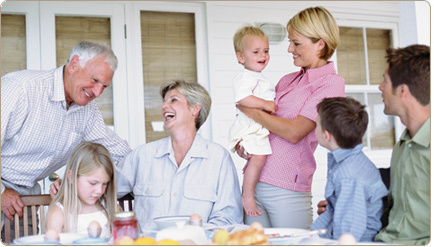 Actinic keratoses range in color from white to red to brown and are most frequently found in older people. Actinic keratoses may appear like tiny red patches in their early stage, and later become scaly. Actinic keratoses may bleed as they evolve into skin cancer. Instead of viewing actinic keratoses as precancers, many dermatopathologists consider actinic keratoses to be embryonic skin cancers, or skin cancers in their earliest beginnings. Actinic Cheilitis: Actinic Cheilitis is a precancerous condition of the lips and is most frequently found on the lower lip due to greater exposure to the sun. The lesion of actinic cheilitis is essentially an actinic keratosis of the lower lip. Actinic cheilitis typically presents as a localized dry cracked area, scaly and pale pink or white in color. Actinic cheilitis is often ignored. The patient usually looks at the lip and can’t believe that the condition is precancerous. “It’s been this way for years,” they say. 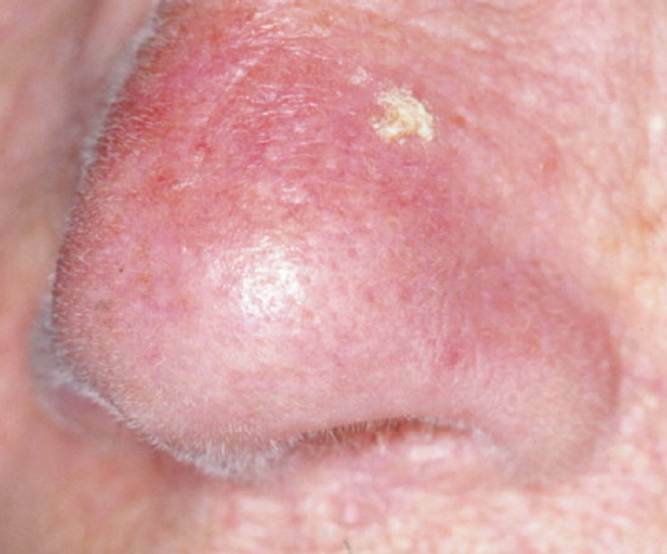 This neglect may lead to squamous cell carcinoma of the lower lip, which has a very high chance of spreading to the lymph nodes. For this reason, Dr. Jacobs is aggressive in treating actinic cheilitis. It is always better to be safe than to be sorry. What Causes Precancer? 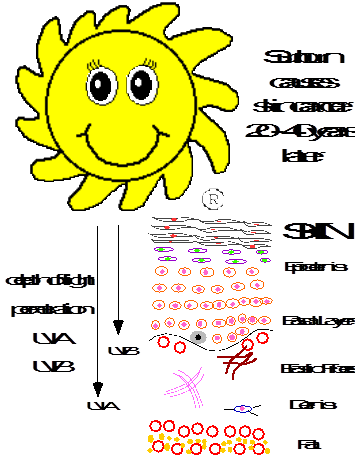 Repeated prolonged sun exposure leads to invisible sun damage of skin. Fair skin persons will be at greatest risk. Occupations requiring prolonged exposure to the sun, individuals spending extensive leisure time in the sun, and anyone with a history of sunburn are at risk. Just like x-rays can penetrate to your bones, invisible UVA & UVB rays of the sun can penetrate under the surface of your skin. When you are exposed to the sun, invisible ultraviolet rays cause damage to the DNA of skin cells. See the diagram above. The damaged DNA forms what is called thymine dimers. 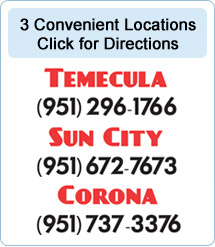 The DNA thymine dimers remain in the skin and may cause skin cancer to arise ten to forty years after bad sunburning. Thus, precancer and skin cancer is a time-delayed reaction. Skin cancer may not show up until years later. What is 5-FU? 5-FU is not an acid and does not work by "burning out" the bad skin. 5-FU is a medically active chemical, which seeks out and selectively destroys the abnormal skin cells with thymine dimers, and leaves the good skin alone. To be specific, 5-FU specifically locates thymine dimers and selectively destroys skin cells that contain thymine dimers in their DNA. How was 5-FU discovered? 5-FU is a chemotherapeutic agent originally and still used to treat solid tumors of the kidney and liver. Years ago, 5-FU was given intravenously to cancer patients. Interestingly, when given to cancer patients with fair skin and a history of sun exposure, doctors noted that the patient's precancers turned red and disappeared. With this observation, 5-FU was then made into a topical cream, and was found to destroy precancers when applied to the skin. What to Expect? Remember, if neglected, precancerous spots have about a 20% or greater chance of changing into skin cancer. We highly recommend that they be treated. 5-FU treatment is a concept in skin therapy called chemosurgery. The Actinic keratoses on the skin are destroyed by selective (thymine dimer) lesion removal. 5-FU is usually applied twice a day to the sundamaged area. Since 5-FU destroys both visible and invisible growths, with therapy, you may have more of a reaction than you anticipate. 5-FU destroys precancers that are visible on the surface of the skin. 5-FU also destroys newly forming precancers that are deep and not seen on the skin's surface. As 5-FU destroys precancerous cells, there is usually considerable irritation, often within 3-4 days. Do not be alarmed about this. This is what we expect. After the irritation disappears (2-4 weeks), good skin will appear. You will notice a new smoothness to your skin. Note: Many people will refuse to use 5-FU because they do not want to appear unsightly. Many of these people have baked in the sun, and some have not, but all have severely sun-damaged skin. This sun damage took years and years to develop. Think about it: Even if it takes a month to treat, considering the years it took to develop, isn't it worth this short amount of time to prevent skin cancer? A few weeks of unsightliness is a small price to pay to reverse many years of sun damage. If you are one who refuses 5-FU for reasons of appearance, please give serious thought to skin cancer and the benefits of skin cancer prevention. Surgery in later years can be far more disfiguring than 5-FU therapy today. Twice A Day Method: With this method, you are given a prescription for two medications. The first medication used is either 5-FU cream or 5-FU solution. The second medication used is a topical steroid cream or ointment. Please understand that 5-fluorouracil and the topical steroid are two different medications. 5-FU is used first, and will cause a "red reaction." After you have developed an adequate red reaction, you will use the topical steroid cream or ointment to cool the red reaction to bring your skin back to normal. Some refer to the topical steroid cream or ointment as the "neutralizing cream" and to 5-FU as the "burning cream." Please do not use 5-FU and topical steroid cream or ointment simultaneously, as they cancel each other out. First, use the (5-FU cream) "burning cream" alone for one or more weeks to develop a red reaction, then totally stop the 5-FU. Second, use the "neutralizing cream" topical steroid cream or ointment for two weeks to bring soothing relief. Twice A Day Fine Points: Your goal: You will use 5-FU to develop a bright red skin color at selected precancerous sites. This color change is called the "red reaction." To develop the red reaction, most patients with precancers of the face will need to apply 5-FU twice a day for 2 to 3 weeks. Lip areas may not tolerate more than 1 or 2 weeks of 5-FU. The scalp or arms may tolerate 4 or more weeks of therapy. The 5-FU should be rubbed in the entire involved area (for example, all of the face, or back of the hands, or lips, or arms, or scalp, or as instructed) twice a day. This can be done with the fingers, which should be washed off with mild soap after completing the application. If you are treating difficult lesions, or lesions of the scalp, trunk, or arms, you may need to apply 5-FU twice a day for up to 8 weeks before an adequate red reaction develops. If you are treating the lips, you may only need to apply 5-FU twice a day for one week before an adequate reaction develops. What should the red reaction look like? The rule is: The thicker the skin, the longer it takes to develop a red reaction. Everyone asks, "How red should I get before stopping the 5-FU?" The answer is: Use 5-FU twice a day until all the precancers turn a bright pinkish red. The treated skin may look like wind burned or chapped lips. Some areas may look like they have been sunburned. There may be crusting with more severe lesions. You may experience mild to moderate pain and discomfort. This redness should remain for three days. You may use Tylenol for pain. When the pain and discomfort is so great that you can't continue with the 5-FU, then, you've probably had enough. At that point, you may stop the 5-FU and begin to use the topical steroid cream or ointment. Scales: It is OK to remove scales from the skin spots before you apply the medicine. You may rub the scales off with a Q-tip. Where to treat: Try to keep the 5-FU away from the eyes, mouth, and skin folds where your nose joins your cheeks. You may need to treat your lower lip if you have actinic cheilitis. When treating the lower lip, remember that the skin of the lip is thin, and there is less time needed to attain a red reaction. Sun Exposure: Be careful to avoid sun exposure while on 5-FU. 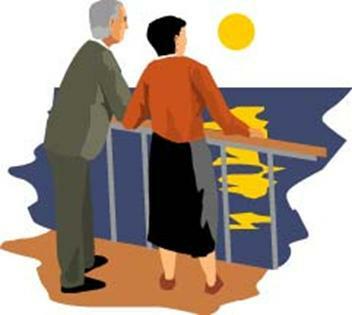 Precancers are due to sunshine that you have accumulated over your lifetime. Sunshine may irritate your treated skin during therapy. A large hat is better protection than sunscreen. If you don't have a hat and must go out in the sun, please use sunscreen with your 5-FU. Shelf Life: 5-FU looses potency, but may still work for years after the expiration date. Small Areas Only: If you have any fears or unanswered questions about 5-FU, you may first try it on a small area (3 square inches or less) for a couple of weeks. Note: Many patients will do small areas only at a time, and change and do a new area every two weeks. This will be Dr. Jacobs “baby steps” method, and it is much more tolerable than doing large areas. Remember, by the yard, it’s hard, but, inch by inch it’s a cinch. The 5-FU is usually applied to entire areas at a time such as the entire face, entire scalp, or entire arm. If you have many bad spots or extensive involvement and do not wish much irritation at one time, you may treat small areas at a time (for example: forehead first, then nose, then one cheek, and so on). Please note that 5-FU will not harm normal skin (skin that has not been sun damaged) Normal skin should not turn red with 5-FU. Make-Up: Many women ask if they can cover the irritation with make-up. Make-up is fine, but must be applied on top of the 5-FU. Cooling: Note: Do not use the topical steroid cream or ointment until an adequate red reaction occurs. In other words, when the red reaction occurs and has destroyed the actinic keratoses, then, you may stop the 5-FU, and cool the reaction with the topical steroid cream or ointment. How to get quick relief for the red reaction: Apply the fluocinonide neutralizing cream as thick and as often as possible. It is OK to use the topical steroid cream or ointment as thick and as often as desired for two weeks as you cool the red reaction. Important: Do not use the topical steroid cream or ointment for longer than two weeks on the face, as topical steroid cream or ointment may cause rosacea (adult acne) with long term use on the face. Scarring: As a rule, 5-FU does not leave permanent scars or discoloration on the skin, but your face may have a mottled appearance for several months following the treatment. This discoloration represents the battlefield where you destroyed the precancerous lesions. Discoloration can be prevented by careful sunscreen use during the months following 5-FU therapy. You may also use a bleaching cream such as hydroquinone. Resistant Areas: The hands, arms, and scalp respond more slowly than the face. You can expect the development of mild burns, tenderness, pain, scaling, and sometimes oozing in the involved areas. These areas respond more slowly than other areas. This red reaction is the goal of treatment but is not essential for therapy. Some patients do not develop a red reaction with 5-FU. Repeat: In severe sun-damage cases, the 5-FU course may be repeated yearly or more often for skin cancer prevention. Quotations on 5-fluorouracil: "5-FU has the distinct advantage of unmasking clinically hidden microscopic lesions." Detlef K. Goette, M.D. "There just isn't any modality as effective for sun damage as 5-FU. When lesions are numerous, 10 or more, there is no physical technique, including freezing as practical for treating so many lesions." "There just isn't any modality as effective for sun damage as 5-FU." "In well over 3,000 patients treated with 5-FU, I have never had any significant residual scarring, even with ulcerations. With other available modalities, there is a greater likelihood of residual atrophic scars that can't be covered by make-up, and often require further treatment. Occasionally, there may be a bit of hyperpigmentation (darkening of the skin) following 5-FU treatment. But that is virtually eliminated, if the patient uses a sunscreen." "The bottom line is that the more severe the skin damage, the more severe will be the patient's reaction, and the more benefit the patient will derive." "Quite a bit has been made about contact allergy to 5-FU. Allergy is a real problem, but its incidence is very small. I recently tabulated that in 3,000 treated patients I had only 3 bona fide allergic reactions." Wayne Simmonds, M.D., Ph. D. "I think 5-FU is a grossly under-used drug with fantastic effects." Albert Kligman, M.D.